Flowers are so huge in wedding décor that we can barely imagine such events without at least some florals or greenery bringing life and beauty to a wedding venue. Choosing the right wedding flowers can be much more of a daunting task than it may seem though. An important factor to consider, especially if you want to be budget savvy or just want the freshest blooms, is what flowers are actually in season all year. So we’ve gathered some tips for you- scroll on and find out more! Lisianthus. Somewhere in between the frailty and girly vibes of a peony and the romantic touch of a wild rose, lisianthus is a wonderful choice all-year round. 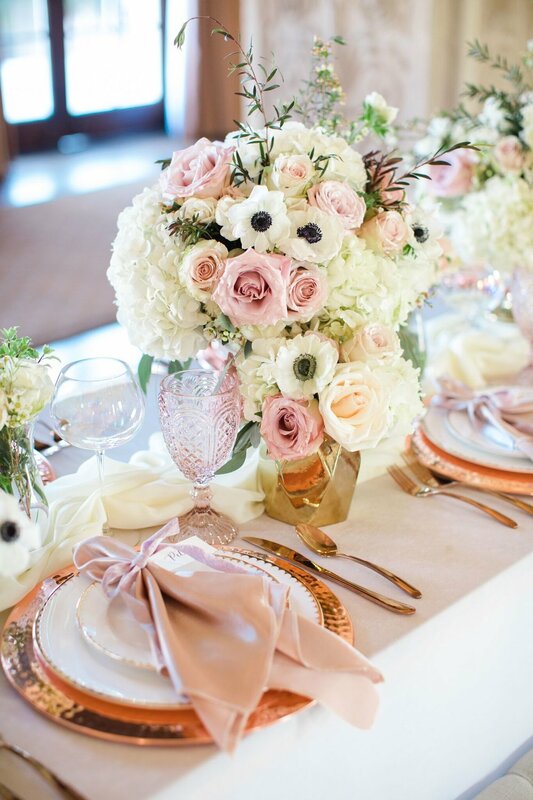 It looks splendid on just about any wedding theme and it comes in a variety of colors similar to that of the peonies – so you can consider these blooms to be pretty versatile. Orchids. Luxurious and exotic, orchids come in a very generous range of colors – so they can be incorporated into pretty much every type of wedding color scheme. If you want something elegant and full of life at the same time, orchids are precisely what you need. Calla lilies. These are the ultimately timeless flowers. They are simple, elegant, and really beautiful. They work with traditional weddings that value the beauty in absolute simplicity and minimalism. They are modern and old-school at the same time, striking the perfect balance between “today” and “yesterday” and “tomorrow”. Dahlias. These flowers have something utterly playful and feminine to them – and they’re available all year round! This may also be the reason they look just as fantastic incorporated in a fall wedding as they do in a spring wedding. Lovely and sweet, these are the flowers perfect for a boho-chic or rustic bride. Roses. They are the ultimate classics of wedding florals – nothing can beat them. Nothing can be as romantic, as feminine, and as absolutely classy as roses, regardless of what color you may choose for your wedding (and they do come in a fairly wide array of shades too, so you really have all the reasons to love them! ).